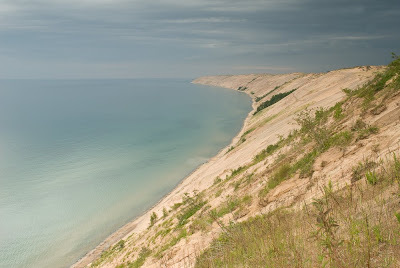 Towering 300 feet over the Lake Superior coast lies some of the most impressive sand dunes in the Great Lakes region. To hike or roll down the dunes, the total height comes to 500 feet - to struggle back up could take up to an hour. I decided to hike along the side of the dunes at about 270 feet to get into a good position to photograph the dunes as the sun set. Unfortunately, it didn't quite happen as planned. I never actually fell down the dune, but a storm came in over the dunes without much warning and got me pretty good before I could get back to the car. I gave up on the dunes even though the sun wasn't due to set for another hour and a half and headed off to a beach to see if the storm would move past. It ended up moving quickly by and provided the best sunset of the five days we spent in the UP. The Grand Sable Dunes as a storm comes rolling in. 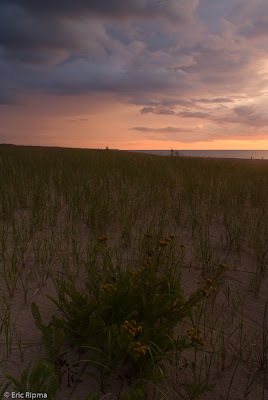 About an hour and a half after the storm rolled through on a beach close to Grand Marais. Take a look at my new photoblog at: http://ripmaphotography.blogspot.com/. The new blog will discuss how I took some of my photos and the equipment involved as well as positive and negative aspects of each image. The storm looks really beautiful although I can imagine it must have been scary. Amazing and interesting shots - the nature in work - love it! Fantastic photos for sky watch friday. Thanks for sharing with us all. The colours of the sky are wonderful. Beautiful photo's ! ! ! I love the second one the most, beautifull colors, well done, have a nice SWF! There wonderful photographs, I love the last one, the sunset contrasts with the stormy clouds. Beautiful and fascinating shots! I've never seen those dunes before, thanks for sharing. Thanks for your visit Rob. After checking out your blog, I can see why you like Sanibel Island. :-) I hope you get to come back here soon to photograph our birds again. Sorry, the post above is mine. Nice shots. I especially like the first one where you've captured the curvature of the dune. Nice perspective of the dune. Wow, I love the first photo. Very cool perspective. That was a great sunset from a surprising day! Amazing dunes and they look very steep, too. I like the peculiar near-storm light very much. Great storm looming, but I really love th land rusing away into the horizon. I've always heard about these dunes - but never seen them. These photos are just breathtaking. I guess it is true what they say! I love the sunset photo. And the way you describe the location makes me think the place is so interesting yet i can imagine falling on the dunes. lol! opppss i forgot to leave my link. thanks to for visiting my sky watch entry.